Today's post is a bit of a follow up from previous comments on using Photoshop to process video files. The question was, how to get stills from a video ... from within Photoshop. Previously, we looked at the Animation panel and we learned about marking our in and out points. It's these points that can be used to assist you in exporting single image files. 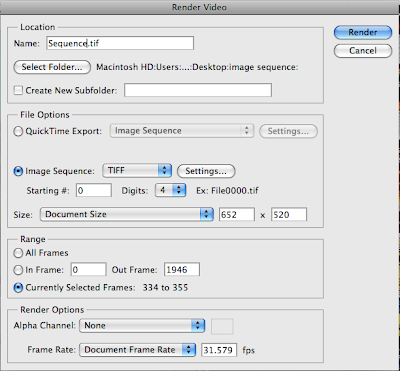 Once you've marked your in / out points, click on File>Export>Render Video. The following dialog box will come up. Choose a name for the files and select the location where they will be stored. If you need to create a new folder for them, you can do that here as well. If you are going to export more than a few still images, it makes sense to aim at a folder, rather than having them populate your desktop. Next, under File Options, select Image Export. You'll have different formats to choose from; I've chosen TIFF in this example. The Settings button brings up the standard TIFF settings dialog box. Then you can choose the starting number and amount of digits that will be added to the file name upon export. The Size should be left as the Document Size - so that no interpolation takes place. If you are working with in / out points, select Currently Selected Frames. You can also export all of the frames or select the frame numbers yourself. Like Document Size, Photoshop reads the file's frame rate and puts that information into the dialog, so no need to worry about matching speeds here. With all that done, click Render. Depending on how many stills are being exported, this process should take anywhere from a few seconds to a few minutes (as always, your mileage may vary, subject to terms and conditions, etc.). After the stills are rendered out, have some fun. Open Bridge, Stack the files, and play back the Stack.